Pictured Left: Bondy Intermediate School student Anas Arrakkal poses next to his Best of Show winning science fair project “Fuel for the Future”. Arrakkal is one of nearly 30 that will go on to represent Pasadena ISD at the Science and Engineering Fair of Houston in February. Over 70 Pasadena ISD students walked into the San Jacinto College Central Campus science building Friday, Jan. 23, anxious to construct their displays for the District’s Secondary Science Fair. Participating students represented nine of Pasadena ISD’s intermediate campuses and also included seniors from Sam Rayburn High School. Serving as judges for the science fair were more than 20 college professors from the three San Jacinto College campuses, the director of the San Jacinto College Aerospace Academy and members of the Geophysical Society of Houston. The students were judged in nine categories including Chemistry, Biochemistry, Plant Sciences, Behavioral and Social Sciences, Medicine and Health Sciences, Energy and Environmental Sciences, Materials Engineering, Physics, Team Division and Senior Division. 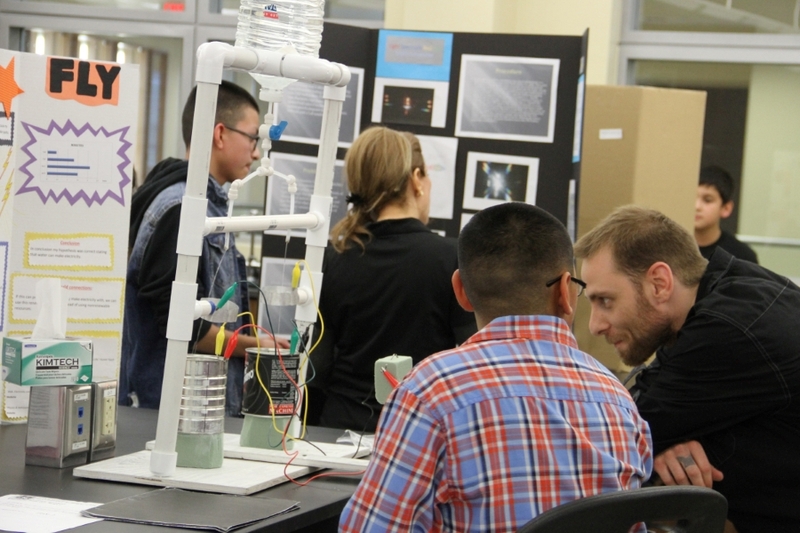 Students presented their projects to three separate judges before being dismissed to participate in science and robotics demonstrations by San Jacinto College students. First, second and third place ribbons were awarded in each category as well as special trophies for Best of Show, Second Best of Show, Third Best of Show, Best Experimental Design, Best Real-World Application and Most Creative. At the awards ceremony, participants along with their families and teachers were welcomed by Dr. Kelly Simons, Dean of Liberal Arts and Sciences at San Jacinto College and Pasadena ISD’s Dr. Karen Hickman, Deputy Superintendent for Academic Achievement. Nearly 30 of the district’s science fair participants will advance to the Science and Engineering Fair of Houston at the University of Houston Alumni Center Feb. 27-28. 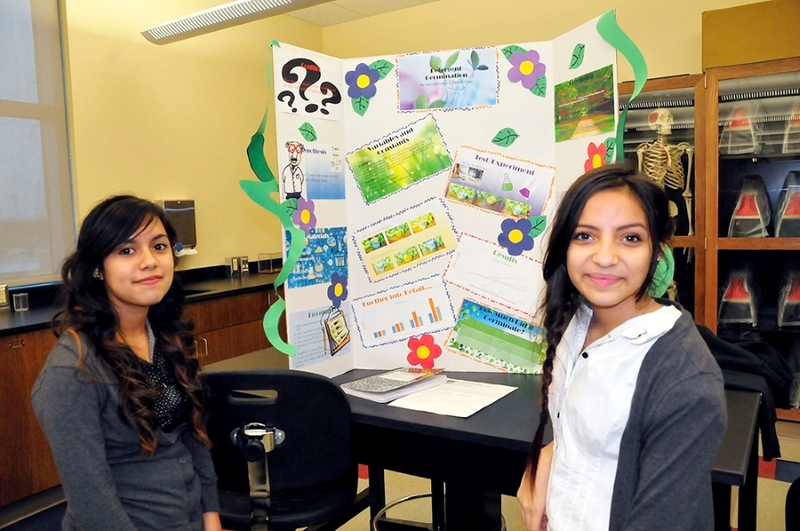 Clara Berrospes and Karla Borrego, students at Jackson Intermediate School, show off their science fair display for “Detergent Germination”. The girls placed first in the Team Division and will represent Pasadena ISD at the Science and Engineering Fair of Houston in February. Angel Aguilar from Beverly Hills Intermediate School discusses his project “When Sparks Fly” with a judge in the physics room. Aguilar took second place in his category, won a special trophy for Best Real-World Application and will move on to the Science and Engineering Fair of Houston in February. *Denotes students who will participate in the Science and Engineering Fair of Houston. Also participating are Mihn To and Ashley Tsikis of Beverly Hills Intermediate; Aquila Berry and Princess Aguilar of Jackson Intermediate; Dulce Garcia of Miller Intermediate and Giselle Quinonez of San Jacinto Intermediate.